It is hard, at first. I had an awkward position of holding the baby, not comfortable with myself sitting while bf her, nor having her latching my breast without feeling the pain. Things were so unpleasant for me but I won't give up. I was so determined to breastfeed her that I ignore the pain, the cut (boleh luka tau anak aku kijekan), the bleed while she could just latch on it. At first, I was wondering what's the big deal of letting her sucking my breast since I couldn't see any drop of milk coming out. I know that it could stimulate the milk and produce colostrum but having her sucking my areola at times she wanted her meal, makes me thinking whether she's full or not. The first day went smooth. She keeps sleeping and just wakes up for about few minutes. I even could have my beauty sleeps but I was too excited seeing her in front of me that I barely sleep. 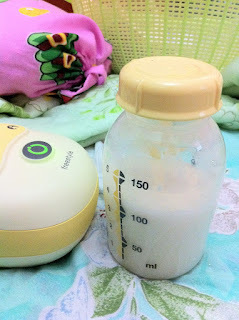 I realize that I started to have the colostrum. Then, things get tougher on the second day, she keeps on crying when she couldn't latch correctly. I was on the other hand was stressed enough seing her crying at at the same time, I started to feel the pain. I keep on calling the nurse whenever she needs to latch on, just to help me to makes myself comfortable when bf and the baby. Tried to pump but hardly have any. That night, I was too stressed that I cried. I closed my eyes and take a deep breath whenever the baby starts to latch, just to imagine that I don't have the pain. At this time, I started to realize, everything that I did by myself before this was wrong. She teach me how to hold the baby comfortably and directing the baby's mouth to latch correctly. That was the first time, I feel so relief that I could smile while talking to others. She then invited me to her class which I did went and it was so helpful. She even share how to store the EBM, handling engorgement and even bathing the baby. Double pump for 40minutes, somewhere on the second week.